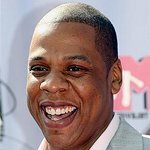 The Safeway Foundation and the Entertainment Industry Foundation (EIF) announced they have raised more than $5.5 million through customer donations to Hunger Is, a joint charitable initiative designed to raise awareness and funds to end childhood hunger in America. Viola Davis Joins Safeway Foundation and Entertainment Industry Foundation to End Childhood Hunger. Now in its second year, the campaign raised funds throughout April 2015 in a month-long, in-store fundraiser in more than 1,600 Safeway and Albertsons stores across the U.S. Additional funds continue to be generated through online donations at HungerIs.org. This national campaign encourages individuals and communities to get involved in solving this widespread problem that too often goes unnoticed. According to the USDA, one in five children in America lives in a household without consistent access to adequate or healthy food. Three out of five public school teachers in kindergarten through grade eight classrooms report that they regularly see children coming to school hungry. 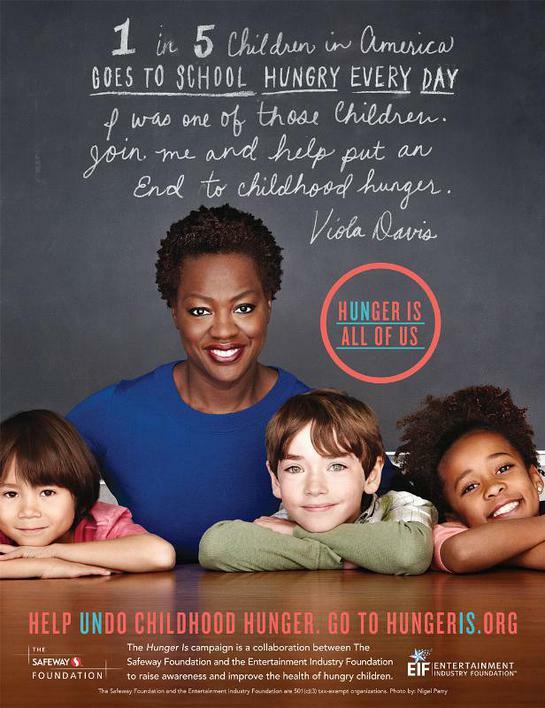 Through 2015, Hunger Is continues to be supported by award-winning actress and ambassador Viola Davis, who has shared her compelling personal story about growing up hungry, not only publicly, but in the initiative’s public service announcements that appear on television, in print, online, and out-of-home media. Thus far, Hunger Is has awarded grants to 214 organizations throughout 20 states across the country. Funds raised through the campaign will support efforts to fight childhood hunger, to increase access to healthy foods and improve health-related and education outcomes. The work of Hunger Is and award of grants is supported by the Hunger Is Advisory Committee comprised of leaders from the most respected hunger advocacy organizations in the U.S., including The Center for Hunger Free Communities (Drexel University); Feeding America – the nation’s leading domestic hunger-relief charity; Children’s Hospital Oakland Research Institute, the internationally renowned biomedical research institute focused on pediatric health; the Food Research and Action Center (FRAC) – the leading national nonprofit organization working to improve public policies and public-private partnerships to eradicate hunger and malnutrition in the U.S.; Growing Power, the national nonprofit organization and land trust helping to provide equal access to healthy, high-quality, safe and affordable food for people in all communities; New York City Coalition Against Hunger which operates the national hunger hotline and sponsors the nationwide Anti-Hunger and Opportunity Corps AmeriCorps VISTA program operating in 32 states; No Kid Hungry – a campaign which connects kids in need with nutritious food and teaches their families how to cook healthy, affordable meals; and WhyHunger, supporting grassroots solutions to end hunger and poverty by connecting people to nutritious and affordable food. The committee provides guidance in defining and addressing needs and makes funding recommendations for approval by The Safeway Foundation and EIF Boards of Directors.